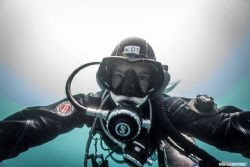 I'm Sean from Germany, I'm 18 years old and I am a GUE Techical and Cave diver. I just started underwater photography in mid 2017. I now have a Sony a6300 in a Nauticam housing. I'm trying my best to capture the underwater World from its best side, mostly here in Germany.